Who doesn’t love themselves a good skirt? They can be easily dressed up or down with the right accessories. From wearing them to work to wearing them a night out or even to brunch with your BFFs over the weekend, a skirt is a true wardrobe staple. However, there’s one type of skirt that you should definitely own, and if you don’t it needs to get on your to-buy list pronto. We’re talking about pleated knit skirts. 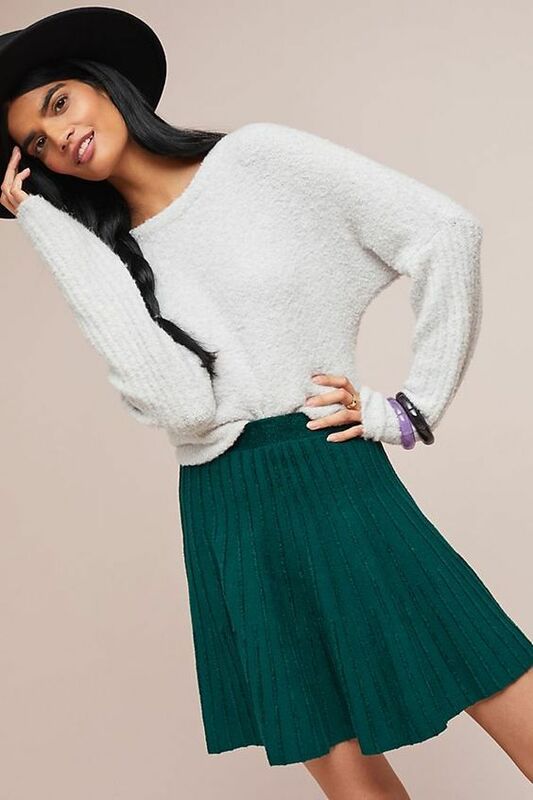 A pleated knit skirt of any length is a true game changer, especially now that temperatures have dropped in much of the country. Not only do you get a bit of coziness thanks to the knit fabric, but also you get the flow of the pleats. What’s not to love? You can style them with other knits, crisp cotton tops, black boots, sneakers, sandals, or mules. So if you’ve never considered this skirt, it’s time you do. To make finding the perfect pleated knit skirt for you easier, we’ve rounded up the best options at various price points on the market. Now shop away! Perfect for all your fall outfits. How chic is this skirt? How stunning is this red? The print on this skirt is great. Here for all things animal print. Pair this chic skirt with your sneaker of choice. Our new favorite pleated knit skirt. We can never say no to a metallic skirt. This skirt is a stunner. A pleated white skirt is a must-have. Hurry, this one is almost out of stock! The ideal pleated knit skirt for all your office looks. You can never go wrong with a black-and-white number. Or one with enough colors. Of course Pixie Market has the perfect knit pleated skirt. This skirt screams holiday party. Dress this skirt up or down. A skirt you can wear to run errands and look effortless. We also love a good slit. And here's how to wear your favorite pleated skirts all through winter.